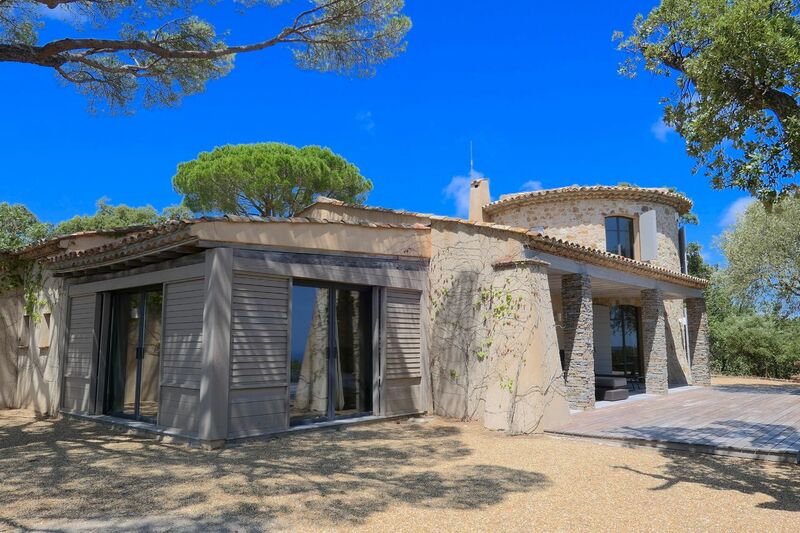 A few kilometers from Saint-Tropez and its beaches, nestled on the heights of a hill, this charming house enjoys a panoramic view of the Bay of Pampelone and the village of Ramatuelle. 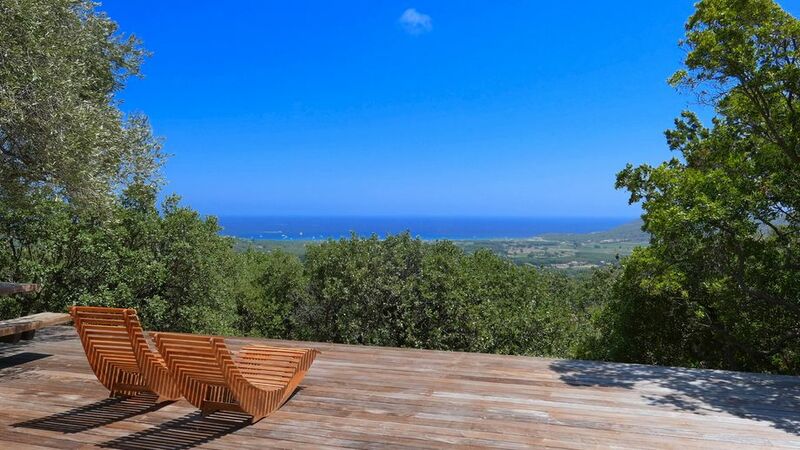 The situation of this house, above the vineyards, on a private land of more than one hectare composed of parasol pines typical of the region, will delight nature lovers wishing to spend an unforgettable holiday in peace and serenity, all being close to the famous Saint-Tropez atmosphere. The house, a beautiful building of 200m2 completely renovated, has a living room of 50m2 with a decorative fireplace and overlooking two terraces. 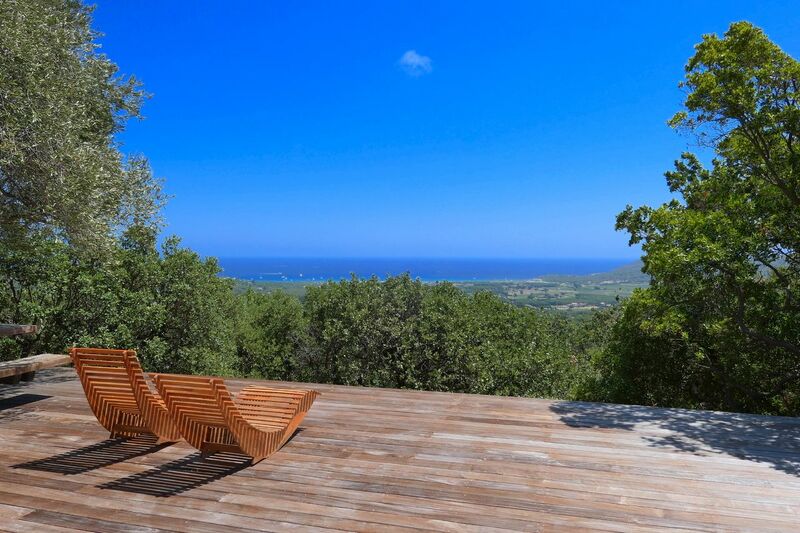 One of them is sea-facing and consists of an outdoor lounge, a sun deck and a shaded dining area under an olive tree. The other terrace, under an arbor, is also equipped with a dining area. Attached to the living room, a large, fully equipped kitchen serves the dining room and a bar with wine cabinet. On the ground floor you will find three bedrooms, one with en-suite bathroom and the other two sharing the same bathroom. In addition, a small bedroom with a pull-out bed for two children completes the night area. Upstairs, a master bed room with private bathroom offers the most breathtaking view of the house. A swimming pool surrounded by a deck completes the property, as well as a petanque court, a play area for children and an esplanade with breathtaking views. Parking for six cars is available as well as some additional sites. -Check in and check out with the reference person on site + 1 cleaning after departure + 2 passes in the week to empty the bins.